I arrived at about 8:30 in the morning and the first thing I noticed upon coming in from the damp chill outside was the delicious toasty warmth of the place. It is fairly spacious, seating about 100, I would guess, and the décor is unmistakably ‘diner-esque’ featuring false brick, green plastic and lots of shiny metal panels. Already, at that hour, the restaurant (which is open 24 hours a day) was quite full and the murmur of conversation, the rushing staff, and the background clatter of dishes all enhanced rather than diminished the inviting atmosphere. I was seated immediately, and a coffee was in front of me in less than thirty seconds. After that, the service remained quick and efficient (and very friendly) and my coffee cup was always kept full. The menu is much as you would expect in a diner, featuring various burgers and sandwiches in addition to breakfast, and there are also some home-style main courses such as meatloaf, a turkey dinner, and old-fashioned pot-roast. There are quite a few choices for breakfast, ranging from light cereals to hefty platters of everything, but, funnily enough, the menu didn’t provide the same sort of mix-and-match list of breakfast type items that one usually sees. Still, the combinations on offer were quite varied and didn’t feel I was being limited at all. 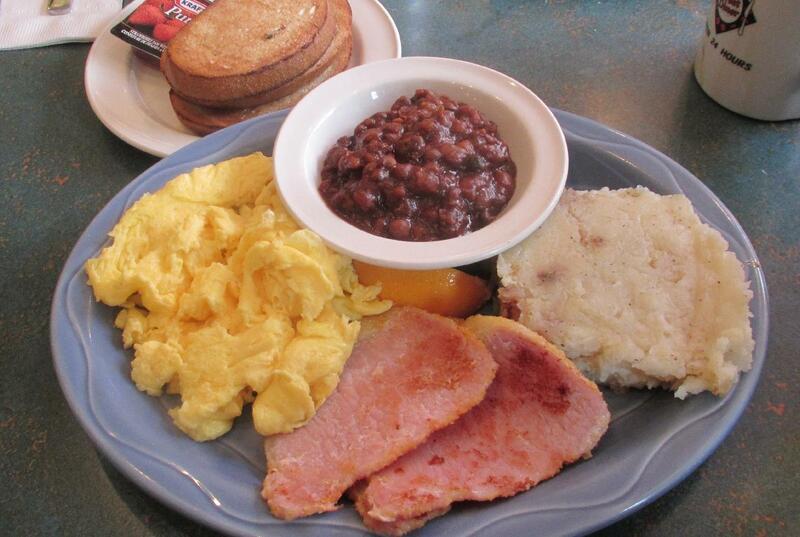 Pea-meal Bacon Breakfast – As promised on the menu, this came with 2 eggs, home fries, baked beans, toast and coffee. The baked beans are made on the premises rather than being canned and, while I am not a huge fan of beans at break-fast time, I found the very rich and tasty indeed. The home-fried potatoes were a little unusual, being ‘smooshed’ down on the griddle so that that they were half-mashed. You can’t really tell in the picture, but the underside was quite crispy and the texture was partly crispy-chunks in the center too. I wasn’t sure how much I liked them but I heard the people at the table beside me raving about them so they are obviously popular. As for the pea-meal bacon, this is basically what Americans call ‘Canadian Bacon’ and which Canadians elsewhere call ‘Back Bacon’, whether or not it is rolled in cornmeal. It was very tasty and cut thick enough to be hearty. The whole meal, in fact, was so filling that I couldn’t quite finish it all but I enjoyed it very much and rate it at a solid 4 out of 4. 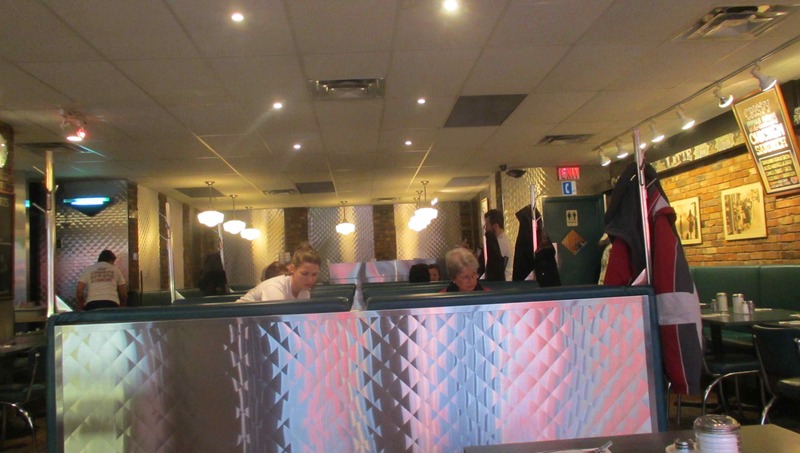 The Elgin Street Diner is obviously a very popular place and deservedly so. It serves good, cheap, and hearty fare around the clock and has a very inviting and cozy atmosphere that makes eating there a pleasure. I would certainly return and I rate it at an unstinting 5 out of 5. 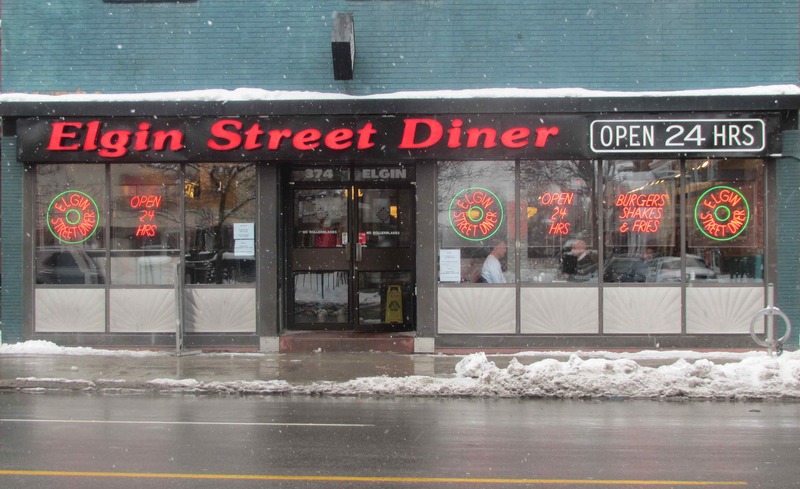 I haven’t eaten there in a while but I love the Elgin Street Diner! They have (or had) a selection of interesting poutines as well, my fave is the “ESD Poutine”. If you go for brunch on a weekend go early as they fill up fast! Not all the reviews have been good but I really liked it too!